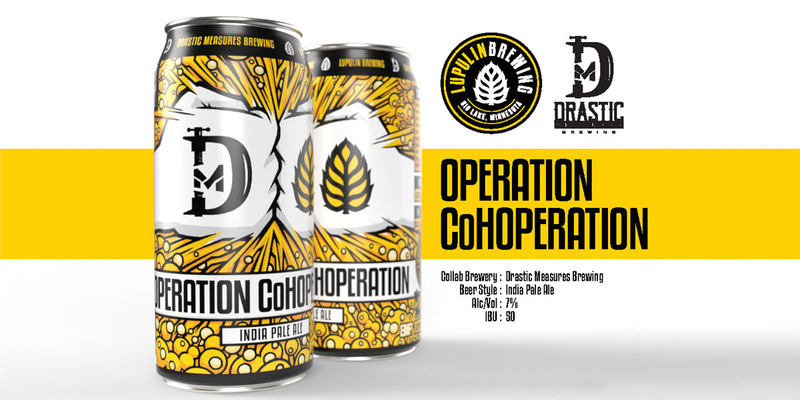 Lupulin Brewing is excited to announce the release of a new beer in its Operation CoHoperation collaboration series. This new version is an exciting IPA made in collaboration with a good friend in the beer industry , Brett Doebbeling, of Drastic Measures Brewing. The beer we came up with for this collaboration has a base of Maris Otter malt and Flaked Oats to make a beautiful malt pillow to support the huge hopping rate for this IPA. We then hit it with a huge charge of Citra, Mosaic, and Ekuanot hop hash to make it extra tropical and juicy. The beer finishes at 7% ABV and 50 IBU. Plans are to release it on draft in the Lupulin Taproom, and as part of the 3rd installation of the Haze for Daze: Hoppy Hazegiving from 11 a.m. – 10 p .m. on Wednesday, November 21st at Grizzly’s Wood-Fired Grill in Plymouth. A limited release of 16 oz 4 packs will be become available the week of December 17th throughout the state of Minnesota. Check Lupulin’s website, Where to Buy, for liquor store locations that carry Lupulin products. Lupulin Brewing is a brewery and taproom in Big Lake, MN. Lupulin’s brewing philosophy is to create rich, full flavored beers with particular focus on hop forward and Belgian styles. Lupulin Brewing is located on US Highway 10 in downtown Big Lake, MN, and can be found online at www.lupulinbrewing.com, on Twitter (@LupulinBrewing) and on Facebook. Drastic Measures is a production brewery set to open in Wadena, MN early 2019, by founder and former head brewer at Disgruntled Brewing, Brett Doebbeling. Drastic Measures can be found online on Facebook.